After the grueling pace of graduate school, obtaining that advanced degree, and finding a great professional career path – you can finally turn your attention to other life choices. 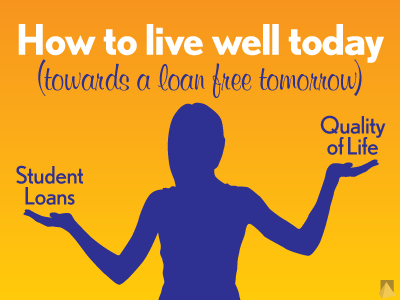 One choice that you’ll be faced with is what to do with the substantial student loan debt. More importantly is, how do you balance enjoying life while starting to pay-off those looming large loans? “Women hold nearly two-thirds of the current student loan debt in the United States.” And “women working full-time with college degrees make 26% less than their male colleagues” according to a study http://www.aauw.org/research/deeper-in-debt/by the American Association of University Women. What does this mean for you? It means that as a busy professional woman, you are not alone in feeling the challenge of trying to balance your career, your life, and your loans. Should you pay off your student loans before you do anything else? It can take years or even decades to pay off student loans, so does that mean you need to live an austere life for as long as your student loans are active? To help you decide, find out where you are now and what your options are. What is the current state of your finances? Take a look at your monthly financials for the last six months. Compare how much is going out in secured debt payments (e.g., home loans, car loans) and unsecured debt (e.g., credit cards, student loans) versus how much is coming in. Are you steadily moving the needle towards a lower total amount of debt, or is your overall debt load the same it was six months ago? Stagnation is not the place to be with debt of any kind. Paying down debt will allow you more options for your future. Assess where you are and decide where you want to go. Having a demanding job as a professional that fills your days (and many nights!) can leave little time to consider options. However, It is important to take a moment and consider your future goals. What are the most important things that you want to work towards now? And what do you want for the future? Maximize your retirement account savings? These goals are just a few of the options you have to consider; all of them affect your bottom line. As your life changes, your future goals will probably change. You may not want a family, or you may not want to take on a mortgage right now, but ten years from now you could change your mind depending on circumstances. Keep your options open and build out your financial plan accordingly. The “graduate student debt review” reports about 40 percent of the $1 trillion in outstanding student loans are from graduate and professional degrees. If you decide paying off student debt is your main focus, develop a repayment plan that meets your needs and allows you to continue saving for your future financial goals. As you review your current student loan debt, focus on paying down the loans with the highest interest rates first. Are you deducting your student loan interest on your taxes? Depending on your salary, you may be able to deduct up to $2500 dollars in student loan interest annually. Meet with a financial advisor to help build out a solid pathway to your debt reduction. We never know when the proverbial bus may strike. Whether it is job loss or family emergency, there are times in our lives when having extra funds are necessary. Take stock of your savings and make sure you are putting some money away each month into an emergency fund. Put your emergency or “rainy day” fund money into a safe and easily accessible account. If something unexpected happens, you don’t want to have to jump through hoops to access it. As a young professional with an intense high paying job, having an outlet outside the office may not yet be part of your life. But are you okay with that right now, or for the foreseeable future? Burnout is an increasing problem for women in the work force. Handling the pressure of work with the added stress of thousands of dollars in student loans from an MBA, a medical degree, or law degree can be difficult and unsustainable. A client I have known for years graduated with an advanced degree while carrying a large student loan debt. She enjoyed her very busy career and took on multiple shifts at work, but had no outside outlet. Years later, the time away from family, the intensity of her career and the added pressure to “keep up” contributed to a divorce and the realization that her life had no purpose beyond work. She had built a life with no outside outlets or relationships beyond her work life. She has since made it a point to build out her life goals and has added traveling and charitable giving to her financial goals. A financial professional can help you lay out financial paths you may want to consider. Before you make any financial decision, however, make sure you consider the repercussions of the choice you want to make, and the directions you want to go. Christina Ubl, CFP®, CDFA™ of Clute Wealth Management in South Burlington, VT and Plattsburgh, NY, an independent firm and registered investment advisor that provides strategic financial and investment planning for individuals and small businesses in the Lake Champlain Valley region. The opinions voiced in this material are for general information only and not intended to provide specific advice or recommendations. This information is not intended to be a substitute for individualized legal advice. Please consult your legal advisor regarding your specific situation. For a list of states in which we are registered to do business, please visit www.clutewealthmanagement.com. Securities offered through LPL Financial, member FINRA/SIPC. Financial planning offered through Clute Wealth Management, LLC, a Registered Investment Advisor and a separate entity from LPL Financial.